Guests are met in Amsterdam** and transferred to the hotel barge mooring in the centre of Haarlem where there will be a champagne welcome. Haarlem is quite a charming and cosmopolitan city full of historical beauty. St. Bavo’s Cathedral in the main square is where both Mozart and Handel played on its magnificent Muller organ. There’s time to relax as you cruise this afternoon to Zaandam before your first gourmet dinner on board. Enjoy breakfast and then take an excursion to the reconstructed historic village of Zaanse Schans with its working windmills, clog makers, cheese farm and mustard mill. Everything the Dutch are known for can be found in this quaint village. This afternoon cruise through the heart of Amsterdam where the small canals and architecture take you back to a previous century. Continue cruising along the Amstel River to Uithoorn where we will moor for the night. Dinner on board. This morning we take a leisure cruise to Gouda, famous for its cheese, pipes and candles. After lunch, visit a local cheese farm and explore Gouda’s gorgeous architecture, excellent shopping and also the most beautiful stained glass windows in Holland. These remarkable windows in St. John’s church date back to the 15th century. Enjoy dinner on board. After breakfast this morning we cruise to Rotterdam, the world’s largest port, stopping at a vodka distillery en route, Ketel One is the oldest distillery in Holland still owned by the same family. We then continue to Delft. Delft is a beautiful town with many historic connections including being one of the starting chambers of the Dutch East India Company and the birthplace of artist Jan Vermeer. The day’s visit also includes a tour of a factory to learn how the world famous pottery is made. Spend the rest of the afternoon strolling around this delightful and historic Dutch city. Dinner on board. Continuing our voyage, we cruise through the canals past Leiden, a charming University town. It is also where many of the Pilgrims lived before they ventured to the New World. Cross the Brasemmer Lakes to Oude Wetering. After lunch, spend the afternoon at the famous Keukenhof Gardens, a 70 acre showcase for the Dutch floral industry. From late March to mid-May, visitors are treated to an ever-changing display of spring flowers beginning with narcissus followed by hyacinths and tulips a few weeks later. Dinner on board. An early morning visit brings you to the worlds largest flower auction in Aalsmeer, where some 10 billion flowers are sold annually. Return to La Nouvelle for a cruise to Haarlem with an optional visit to the Cruquius Museum along the way. The Cruquius pumping station is a beautiful neo-Gothic building built in 1846. Visit the picturesque town of Haarlem and the Frans Hals Museum which has an internationally well-known collection of Old Masters and works representative of the Dutch Golden Age. Tonight enjoy Captain's farewell dinner on board. 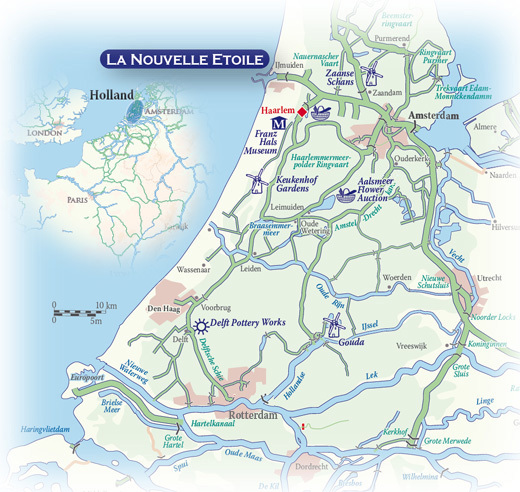 After breakfast, disembark La Nouvelle Etoile and transfer back to Amsterdam**. The designated meeting and drop off point is Amsterdam. Other options are available for charter groups.